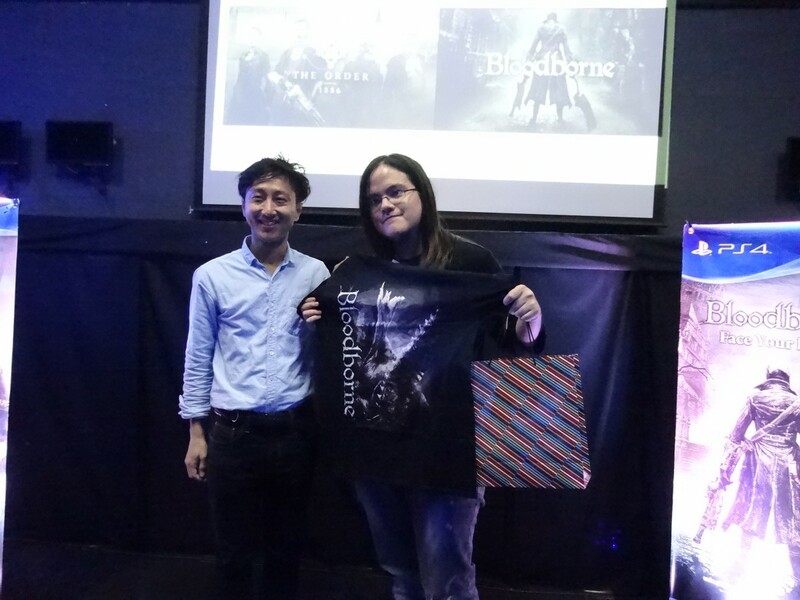 On February 04, 2015, PlayStation PH, in cooperation with PlayStation HK and SG, held a demo event for The Order 1886 and Bloodborne at the Imperium E-Sports Bar. I was able to attend the event and play the two games featured. Apologies for the photo quality as we weren’t allowed close up pictures of the games. At the start of the night we were given a presentation by PlayStation executives on The Order 1886 and Bloodborne detailing the theses behind each game’s development. We were then shown messages from The Order 1886’s director, Ru Weerasuriya, and Bloodborne’s producer, Masaaki Yamagiwa. After, we were given a demonstration of each game by special guest Myrtle Sarrosa. But I am assuming you aren’t here to hear about how the event was. Rather, you, dear reader, are here to read about my impressions on both The Order 1886 and Bloodborne. The shooting segement on the left screen and the “stealth segment”. which was basically a giant cutscene with QTEs and a few puzzle segements interspersed between scenes, on the right. I was first able to get my hands on The Order, and the event had two different scenarios for it. The first being a stealth sequence wherein we were able to test out the game’s stealth, puzzle and QTE mechanics. There wasn’t much to actually play in said sequence, but the game looked impressive at the least (definitely helped by the letter boxing used though). The second demo we were able experience was a arena type section, which was used to demonstrate the third-person shooter elements of the game. It was alright, nothing new or special; it was pretty much your typical TPS game. Although, what interested me about the game was the story. The trailer shown to us was pretty much a Hollywood quality trailer that got you hyped up for the story the game has and its set-pieces. But as both the first demo and the trailer showed: that’s exactly whats wrong with this game. Ready at Dawn, specifically Ru Weerasuriya set out to make a “movie like” experience, hell the letter boxing (other than helping the game’s performance by rendering less objects on screen at once) made it seem like a more cinematic experience. But in my opinion that’s not how you should make a game. Gameplay should come first before a story: build your gameplay to help in constructing a story and not put the story first THEN add gameplay just so there can be a game to play. The issue here is that Ready at Dawn picked the wrong genre to make The Order 1886. A tactical turn based strategy game in the vein of something like X-COM or maybe in the style of a David Cage game would have suited the purpose better. As it is, I can’t recommend The Order 1886 based on my impression, unless you’re looking for a cinematic experience with solid shooter element– you know, like Sony’s other big seller game: The Last of Us. Now that I’ve brought up my gameplay versus story philosophy of game design, let’s talk about From Software’s Bloodborne. To those who aren’t aware, Bloodborne is the 4th game in From Software’s Action RPG Soul’s series. The series is known for its supremely punishing difficulty where if the player dies he is punished by having his Souls, which act as both the player’s EXP and currency, dropped upon death. This can still can be recovered if the location of his death is reached after the respawn, BUT if the player dies again before picking the Souls up, it is lost forever to the ether. The series is also known for its Metroid-esque design wherein the player is left to his devices to figure out both the story and proper paths to take to progress in the open-world map. The control set up on the left screen and the spawn point of the demo on the right. The Demo for Bloodborne allowed you to pick between 4-weapon sets: the Cleaver/Shotgun, Axe/Shotgun, Hammer/Blunderbuss, and Dual Blade/Pistol combos. After picking the character you are dropped in a little snippet of a traditional Soul’s series map. This is when we discover the new mechanics in Bloodborne that aren’t in the previous three games. First of all there are no more shields in the game, limiting the player’s defensive options. The shield is replaced by guns, which act as a ranged weapon as well as the parry system of the game; if you shoot an enemy during its attack animation, it puts him in a stagger state which allows you to perform the riposte attack. Secondly, the main healing item is no longer a replenishable resource. Thirdly, Bloodborne introduces the “rally” mechanic that is similar to the red health mechanic of fighting games. How it works is that after taking damage from an enemy the player can replenish the lost health, represented as an orange bar filling in the missing health, by attacking an enemy. The way they balance this is that if the player takes too long to attack, or the take a second hit of damage, the orange health is lost and cannot be replenished. Finally, because shields aren’t available to use, From Software made the dodge moves more forgiving by making them A LOT quicker and have more invincibility frames. DON’T MISS: Square Enix Unveils Teaser Website For New Project! pretty cool design looking like a large hairy female giant with a disfigured head, if I had to describe it I’d say it looks like the Nina chimera from Full Metal Alchemist on steroids (feels). The fight is similar to the bigger boss fights found in both Dark Souls 1 and 2 where the enemy has a giant wind up and pretty obvious tells, but if you get hit by the attack you’re gonna see a big chunk of health gone from your character. Now, I didn’t have the luxury of time on my hand as everyone was limited to 10 minutes when playing the demos, so I had to rush through the mob, have limited item pick ups because I wasn’t exploring, and not have the friendly NPC to help me fight the boss. So did I beat it? Yes, in fact I did, and was only 1 of 2 who was able to do it during the demo, and I have this shirt to prove it. Me, the hippy with long hair, being a straight-up baller. So those are my impressions based on the demos of The Order 1886 and Bloodborne. From what I played, I fully recommend getting Bloodborne as it feels a lot better to play than Dark Souls 2, which I REALLY liked but was also disappointed in; and as for The Order 1886, I’d say consider it. The Order 1886, as I said earlier, has run of the mill, but solid, TPS mechanics but its story seems intriguing enough to consider a buy. Bloodborne is stated to come out on March 24, 2015. Also known as the saltiest person on the planet. He loves all things geek particularly video games, board games, and anime. ← Magic Mike XXL Teaser has landed!